Product prices and availability are accurate as of 2019-04-03 22:34:14 EDT and are subject to change. Any price and availability information displayed on http://www.amazon.com/ at the time of purchase will apply to the purchase of this product. 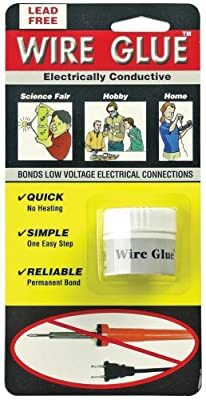 Soldering Gun in a Jar Wire glue-the solution when you can't find the soldering iron, don't want to bother, are out in the woods, don't quite trust a fifth-grader with a hot gun, can't reach the connection with both hands, whatever. This stuff conducts low voltage AC and DC circuits in a permanent bond and is easy to use. Our high-tech support group suggests that a toothpick is a good way to apply it. Cures overnight. Our each is a 0.3 oz/9ml jar.